Today’s nonprofit organizations operate in a systems* world. Executive Directors who appreciate this reality spend significant time in the community sitting at systems tables and engaging in collaborative initiatives. Two major drivers of this external work include ambitious organizational visions and changing funder expectations. While senior nonprofit leaders are immersed in systems level work, what is the board’s role from a governance perspective? In this blog we explore some of that ways boards can think, act and govern differently to support their organization’s systems level work. Many charitable organizations have articulated bold visions for community change that they cannot accomplish alone. Realizing these visions requires working with other system actors – individuals and organizations –across sectors and in some cases across geographic boundaries. By extension, organizations and their boards need to understand the broader system and engage more actively beyond the boundaries of the organization. Traditionally boards have focused internally on organizational performance, health and stewardship. Such an internal focus doesn’t necessarily enable the organization to realize a bold vision. It’s time for boards to adopt a system mindset. This begins by better understanding the broader systems that their organization is a part of, and exploring how their organization’s contributions compare to, and complement, work being done by other organizations. Encouraging and supporting an organization to map service systems and actors in order to identify complementarities and duplication can be a good place to start. Government funders are thinking more about how to improve the systems they have inadvertently created through historic funding practices. They have two significant concerns: first, many service systems are difficult to navigate, and secondly, government is unclear about its return on investment, and whether investments of public funds are making a difference. In an era of fiscal constraint, improving efficiency and effectiveness have become government mantras. Funders also want to know which organizations deliver results. Demonstrating impact based on evidence is an increasingly important aspect of sustaining funding. Part of the board’s work involves ensuring the organization allocates resources to evaluate the effectiveness of the organization’s programs and services. Some government funders are asking grantees to consider how they contribute to systems change. Nonprofit organizations and their boards are challenged to assess what their organization, and others, do best. Many organizations, like the service systems they work in, have evolved organically, adding programs when new funding is available. This has led to diversification and a proliferation of multi-service agencies, some of which have strayed from their original mission and area(s) of expertise. In a competitive funding environment, where administration funding is scarce, some agencies rely on a patchwork of program funding to keep the lights on. This can make it difficult to acknowledge when another agency may be in a better position to take the lead on a new initiative. Yet in the interest of better system and community outcomes, organizations need to consider divesting some programs, collaborating differently, and focusing on core areas of expertise (see Wei-Skillern’s 2014 article). Board members, as representatives of the community, may be well positioned to help an organization see itself in the context of the broader system. 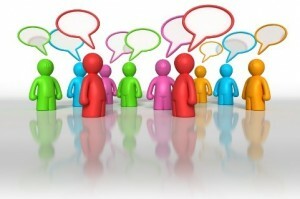 The board can support the organization in questioning assumptions and making tough decisions. What does the community need today? What is the organization’s core expertise? What does the organization do well? In some sectors, such as child welfare, government has directed organizational integration to rationalize and improve access to services. More recently, the provincial government introduced a “lead agency” model in children’s mental health. This outsources the challenging task of determining how to allocate funding to lead agencies working within the system. This model may give children’s mental health agencies more input into how to improve and rationalize the service system in the interest of children and families. Individuals vary in their ability to see and think about systems in part because it’s not widely taught. Making the system visible through mapping is one way to accomplish this. Other frameworks, processes and tools can assist people in seeing the system and shifting their focus from the organization to the issue it is trying to address. When David Hughes was President and CEO of Habitat for Humanity Canada, he shared diagrams similar to the ones below when speaking at a session in Toronto. He indicated he used these to encourage and remind his board and staff to shift their focus from the organization to the cause; and to see the organization as part of a system of actors interested in solving a common problem related to Habitat’s Mission (this reflects Freiwirth’s Community-engagement Governance framework). These visuals are highly simplified maps of system actors. The image on the right, with the cause at the center, reflects a “Collective Impact” approach. Collective impact involves bringing actors from different sectors together to clearly define a problem and common agenda (or cause); identify bold goals and shared measures; and explore how different actors connect and make distinct contributions. This work helps all involved “see” and better understand the system(s) they are part of. This approach is being used in Canadian communities to address poverty and create vibrant communities. Collective impact relies heavily on data collection and analysis to assess what is happening in the system, determine what’s working well/less well, and to surface emerging patterns. Benefits of being part of such an initiative include access to robust information about the cause and gaining a better understanding of other actors in the system and how each is addressing the problem. If an organization participates in a collective impact initiative, as governance leaders, boards should consider a variety of questions, such as: what areas should the organization take a leadership role in? What risks might the initiative expose the organization to? What role is our organization taking in the governance of this initiative? Does a memorandum of understanding clearly define the contributions of all parties? 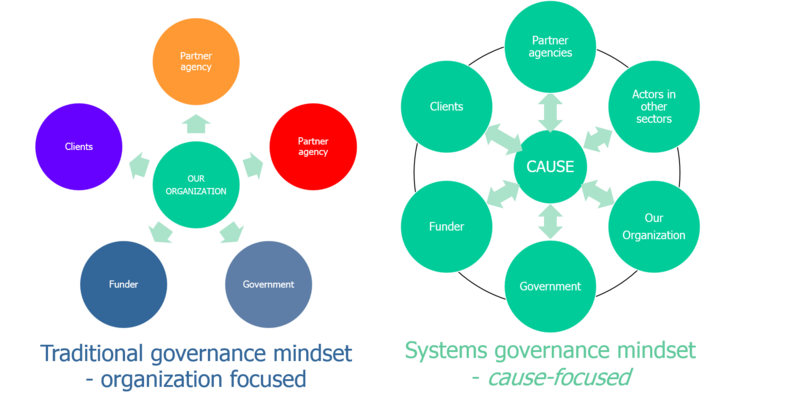 The image on the right identifies clients as one of the system actors or stakeholders; and Freiwirth suggests they are the primary stakeholders in an organizational system. This reinforces that boards need to find ways to understand clients’ perspective on the organization and the systems it operates in, in the interest of better meeting their needs. While some organizations survey clients periodically and share the results with the board, others engage clients more actively in organizational decision-making. Some organizations engage clients in examining issues and co-designing solutions to the challenges they experience. Other organizations recruit clients and people with lived experience onto the board to ensure their experience influences decision-making. Boards that do so generally adapt their processes and support individuals with lived experience in sharing their experience and voicing their perspectives in the boardroom, a space that is intimidating for some. Environmental scanning is a key tool that can help an organization, or group of organizations, identify and determine how to respond to systemic trends and forces impacting their cause. While many organizations scan the environment periodically as part of strategic planning processes, board members may be well-positioned to help an organization monitor and reflect on changes in the external environment on an ongoing basis. EDs and CEOs can share relevant information with their boards and invite boards to share their external perspectives and to anticipate the unintended consequences of proposed responses. Joint environmental scanning initiatives can be particularly efficient and effective in helping organizations understand the system as they benefit from the knowledge, information and perspectives of different system actors (our blog EnviroScan21 describes such a process). 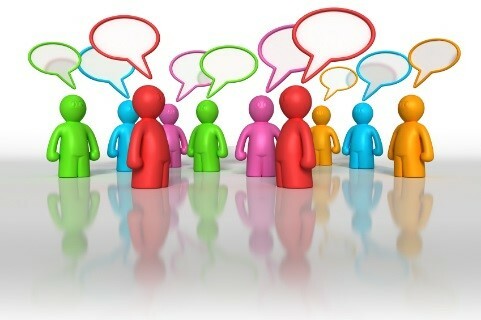 A board might host a joint symposium where the boards of different agencies can collectively explore the results and implications for different organizations and the system. In a systems world boards have an important role to play in helping an organization focus on and understand the broader system. Some of the board’s work involves engaging with others in the community who share common cause. It is also about having different conversations in the boardroom –inviting all to focus on the cause and the system. What critical conversations and questions do boards need to engage in related to governing in a systems world? The sample questions below are crafted for organizations that are just starting out, and those that are actively engaged in this process. Do we have the skills, knowledge and resources to govern in a systems world? What do we need to learn more about? What due diligence and risk analysis should we do before entering into collaborative initiative?What might be the opportunity cost of moving in this direction? Who shares common cause with us that might help us accomplish our vision? Who would benefit from our adopting a stronger systems orientation? To what extent will participating in this collaborative initiative help us shift the system and meet our organizational goals? What is our unique contribution? What spaces might we create or participate in to engage others in thinking about the system? How might we govern from the bottom up? Who else needs to have a role in governance and how might we engage them? How might we govern with the system at the center?As the systems we work in become more integrated, how might we need to adapt our approach to governance? “Systems are composed of multiple components of different types, both tangible and intangible. They include, for example, people, resources and services, as well as relationships, values, and perceptions.” (p. 7, Abercrombie et. al, 2015). A framework for evaluating systems initiatives. Build strong foundations for our youngest children. Julia Coffman. August 2007. Collective impact. John Kania and Mark Kramer. Stanford Social Innovation Review, December 2010. Engagement governance for system-wide decision making. Judy Freiwirth. Nonprofit Quarterly, Summer 2007. The Networked Nonprofit. Jane Wei-Skillern and Sonia Marciano. Stanford Social Innovation Review, Spring 2008Review, Spring 2014. System mapping: A guide to developing actor maps. Srik Gopal, Tiffany Clarke. FSG publication. December 2015.